The fall electrofishing reports from the Green River are in. LAST WEEK’S BALMY weather was phenomenal—perfect for a two-night electrofishing survey on the Green River. This was the first time I’d ever piloted the jet boat up and down the river wearing only a short-sleeve shirt (along with my PFD, of course). 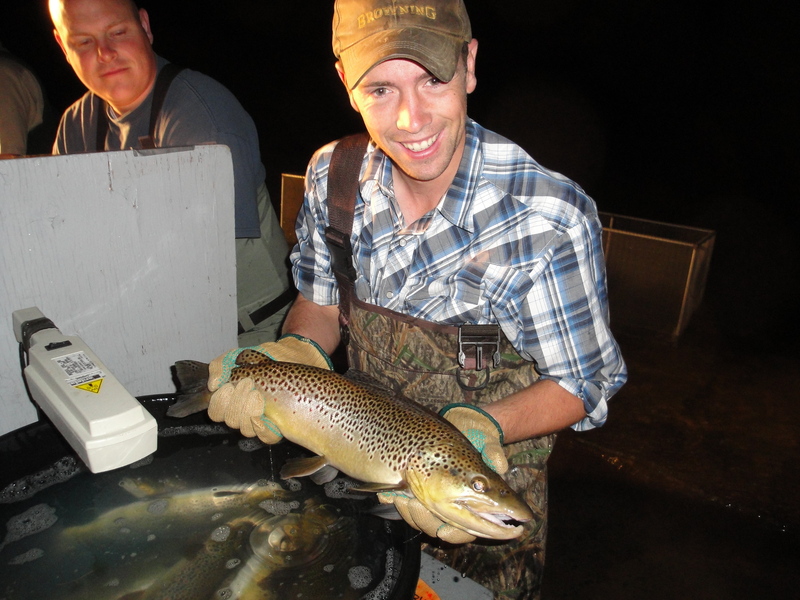 Casey Snider from Trout Unlimited holds a big brown trout during the Green River survey. On the first night, we sampled a one-mile stretch of river just below the dam, collecting a total of 527 fish. Once the fish were shocked and gathered, they were brought back to the Spillway launch where we set up our short-term “fish lab.” All fish were measured, weighed, scanned for dye marks and tags, and pumped for stomach contents. Then they were released to live and fight another day. Many of the larger rainbow trout were shaped like Spalding footballs, especially those in the 15- to 17-inch size class. Brown trout have also taken on a new look, and the night’s big fish was a 20-inch brown trout weighing in at 3.5 pounds. The next night, we wrapped up the fall electrofishing survey on the Green River at our second sampling site: Little Hole. Sampling and processing protocols were the same as the first night. We sampled a total of 552 fish from a one-mile stretch extending downstream from Little Hole Ramp #2. Once again, we quickly concluded that the fish are really healthy this year! Notable results were the overall condition and size of the trout, increased numbers of whitefish and another catfish, which likely moved up from the lower Green River. Many rainbow trout electrofished on the Green River had a Spalding football-like shape. Just like our first night sampling, we found a number of rainbow trout with that “Spalding” appearance. We saw quite a few, some as large as 18 inches and 2.6 pounds. Brown trout were more prevalent and ran about the same size. The size of the whitefish also amazed me. I still wonder why more anglers aren’t targeting whitefish—especially in the winter months. Our big fish on night two was actually a whopper whitefish measuring in at 20 inches and 4.5 pounds! That’s not far from the official state record caught in 1997. Can you imagine the fight that fish would provide on a five-weight fly rod? That concludes this fall’s sampling on the Green River. We’ll do it all again next April. Many of the veteran volunteers commented on the impressive condition of the fish this fall, similar to what anglers have voiced all summer. We still have to crunch the data, but I can safely say there are lots of fish down there and anglers should continue to see really fat and healthy specimens on the end of their lines. Did stomach samples reveal increases in New Zealand mud snails? The diet data was collected this fall, but it’s still being processed by Utah State University’s Bug Lab. NZ mud snails are sampled on the Green River during quarterly monitoring completed by USU. There was a declining trend from 2007-2010, but densities increased in 2011 to about 100/square meter. This is still much lower than the peak observed in 2004, which was about 250/square meter. Density data from 2012 is also still pending. A report is typically completed and available by December each year. 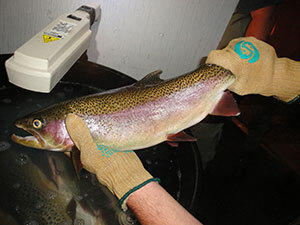 Where can I get information about the rfid tagging of trout in Logan Canyon and other areas in Utah?